AgEagle won't just be in Kansas anymore. The precision-agriculture drone and unmanned systems developer founded in Neodesha, Kansas, will soon be listed on the New York Stock Exchange under the ticker symbol UAVS. According to the FAA's aviation forecast for the next 20 years, the UAS industry will experience "phenomenal growth" between 2017 and 2022. It expects the number of commercial systems to quadruple while hobbyist done ownership more than doubles. Raytheon is sprinting into the drone swarming market. The technology developer that specializes in defense, civil government and cybersecurity solutions, is developing a new technology suite capable of controlling drone swarms. It's been seven years since Japan’s Fukushima Daiichi nuclear power station was damaged by an earthquake and a tsunami. A team of U.S. engineers is planning to fly drones into the plant to gather information on its damaged containment vessels. 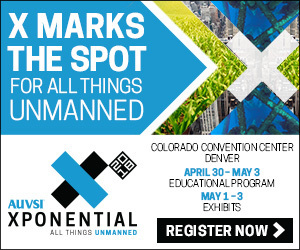 Aspen Avionics of New Mexico and Minnesota-based Sensurion Aerospace have formed a partnership aimed at filling the certified avionics gap between hobbyist and military drones. This will include autopilot, communications and navigation systems. Commercial drone data company Skycatch, and DJI, a manufacturer of civilian drones and aerial imaging technology, have extended their partnership to manufacture and deliver a fleet of high-precision drones for Komatsu Smart Construction.